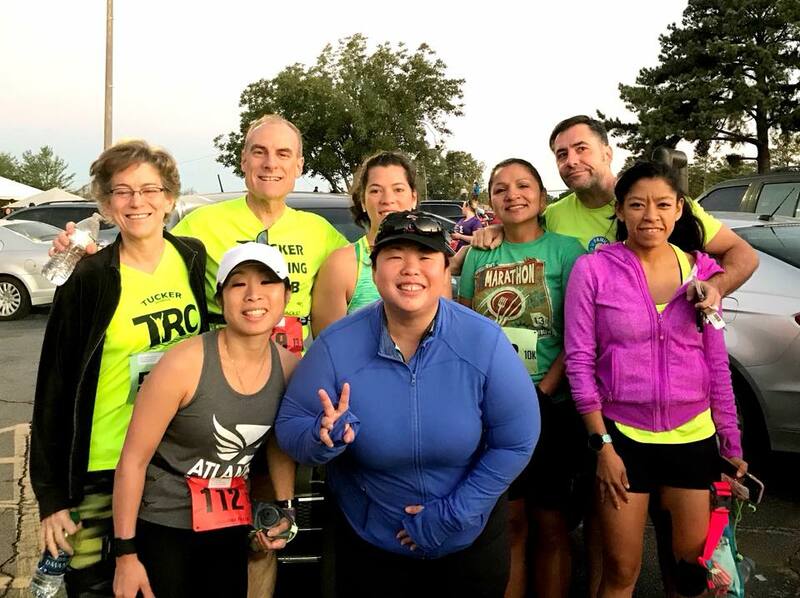 Last year I ran the inaugural BuHi Half, celebrating the Buford Highway corridor. 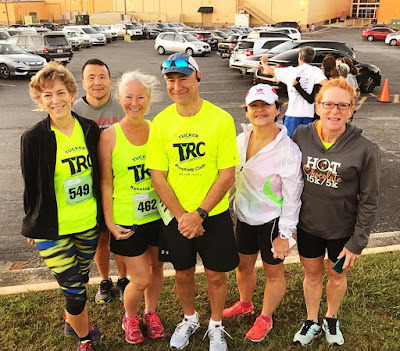 I complained in the blog post and to others about the race being a quarter-mile short of the 13.11 miles of a legitimate half marathon, and had considered not running it again this year. But in June, an offer that I couldn't refuse appeared on Facebook, offering half-price ($40) registration for the first 50 registrants. So I registered, adding a donation to Raksha, a sponsor organization that provided timely assistance to the children of one of Bonnie's clients a few years ago. A different race route was also advertised, so I was hopeful that they had carefully measured the new route. 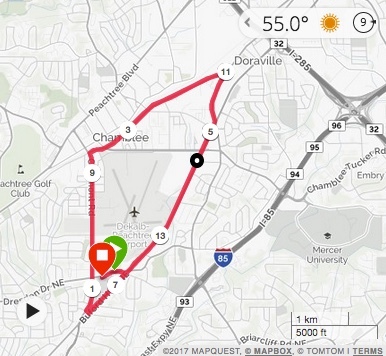 Then around 10 days ago, I received an e-mail announcing that the route had changed, due to difficulties with permits, and the course would now be two loops of a 6 - 7 mile course. I was momentarily disappointed, but decided that since I'm working on negative splits, I would "gather information" on the first loop and then might run a bit more aggressively on the second loop, knowing where the uphills and downhills would be located. a 2-mile stroll, beginning at 8:05 am. Bonnie and I arrived shortly after 6 am, so that I could pick up my bib and get in a few miles warming up the legs. I was due to run 18 miles this weekend according to the marathon training program, so I figured I would run 3 before hand, 13.1 during the race, and hopefully have enough discipline to run 2 cooldown miles afterwards. I ended up running three laps around the Plaza Fiesta mall area, covering 2.32 miles altogether. After three loops, my legs felt good, and I thought that it would be best to check in with the porta-potty instead of running one or two more loops. Wise choice: a 10-person line when I joined was probably five times as long when I finished my pre-race business. It was also nice to socialize with a few other runners from Tucker Running Club and Big Peach group runs while waiting for the start. Tucker Running Club members - (above) those available at 7:15 am! (below) 10K and 5K runners, with a later start time. We watched the start of the bike race, and then it was time for the half-marathon runners to gather on Dresden Road for our start, across from Peachtree-DeKalb airport. I lined up with Kilsun Hogue, Myriam Fentanes, and Carl Line, about 50 feet from the starting line. I remembered from last year that there was not a starting mat - all times were "gun times" - and so I wasn't going to modestly take a position further back in the pack. As the airhorn sounded for the start, I realized that I was in the "right place", with people around me running around a 9 min/mile pace, which was my goal for the first 6 miles. Yes, a 9 min/mile pace is a faster start than what I have taken for the previous two half-marathons (Hotlanta Half, Craft Classic), but with the reasonable temperature and the state of my conditioning, I felt that it was worth trying. From about 10 minutes into the race - I'm still carrying a water bottle from pre-race warmup. The first five miles went well, with a very steady pace ranging from 8:54 to 9:06. My watch was perfectly synced with the posted mile markers, so that was reassuring. I ran intervals of 3:30 running, 0:30 walking, and that served me very well this morning. As the miles ticked by, I was able to catch up to and then pass a few of the others that were running steadily for the entire race. There was a tough uphill section on Clairmont Road near the end of mile 3, going up to an overpass over the MARTA tracks, made more challenging by running into a relatively strong wind from the east. Somewhere along New Peachtree Road, a runner passed rapidly on my left, who I realized must have been the 10K leader. Wow, he was moving fast, and we had a 15 minute head start on him. Also, he must have had to navigate through a bunch of the slower half-marathon runners for the past mile or so. Over the next few miles, three more men and one woman passed me at paces matching what I would expect for fast 10K runners. The race route, two loops run clockwise. 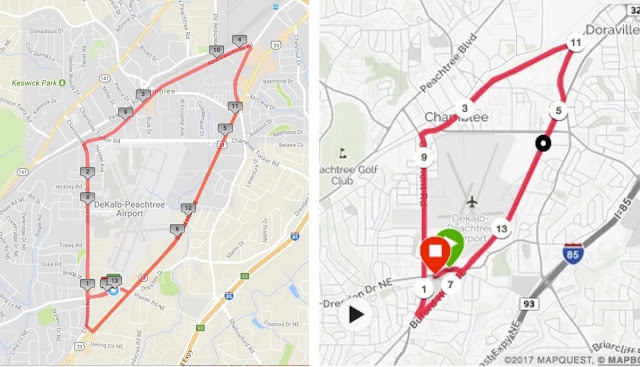 We turned onto Buford Highway shortly before the mile 5 marker, reaching the Chamblee campus of the Centers for Disease Control (CDC) after crossing Chamblee-Tucker Road. Here the route became a bit crowded. The 5K route was an out-and-back, which joined our route for the second half. Given that they had started 30 minutes after us, the middle of the 5K pack was on Buford Highway as I reached them. I passed Carolyn Weber in this section, who was struggling with a sore knee - although she looked good - and won her age group for the 5K race - congratulations Carolyn! Much of mile 6 was a nice, steady downhill stretch, which I finished in 8:38. There was a relatively undeveloped area with forest to our right, which was hiding the airport from view, probably also a bit of a sound buffer. Around the 6 mile marker, we passed Hola! Auto Sales, and several hundred feet later, Amigo Auto Sales marked our return into a more urban area, across the street from the Crawfish Shack. Passing Dresden Road (down which we had dashed to the finish line last year), we came up to the next street, Plaster Road, where a policeman was clearly directing 5K and 10K runners to turn right, half-marathon runners straight ahead on Buford Highway in front of Plaza Fiesta, to begin our second lap. I took a quick look at the watch, noted 6.85 miles elapsed. Bonnie was taking short videos of each runner that she knew as we passed, I gave her a smile and two thumbs up, as my watch signaled mile 7 completed, in 9:03, and 1:02:37 elapsed. For the past two or three miles, I had been "leapfrogging" Carl Line, a buddy from group runs at Big Peach Running Company - Decatur. I was a little interested in keeping up with Carl today, as I joined his age group a few weeks ago. Carl is generally a little faster than me, especially in warm weather, where I struggle. To both of our surprises, I had managed to outrun him in the BuHi half last year. I wasn't necessarily expecting to do so this year, but I felt good with my pace and strategy. 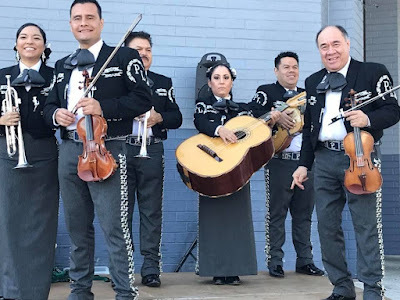 We made the turn from Buford Highway onto Clairmont Road, passing Los Rayos Taqueria - best guacamole ever - 3473 Clairmont Road, Brookhaven - and I noted as we passed the mile 1 marker on the back side of Plaza Fiesta, my watch was at 7.73 miles. 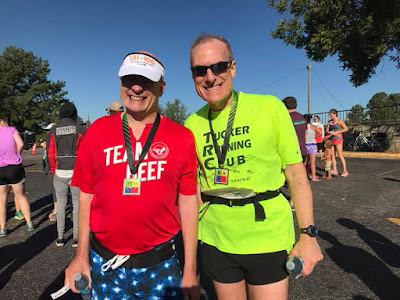 There had not been a mile 7 marker and I didn't remember seeing any markers for the higher miles on our first loop, but I could add 6.73 miles every time I passed a mile marker for the rest of the race. Reaching Dresden Road, I saw a man running from Dresden onto Clairmont ahead of me, followed by a woman. When she saw me and Carl coming from the south, she said "I think that I messed up the half-marathon!" I said, "yes, we're nearly 8 miles in." Carl and I chatted about this for a moment as we ran, wondering how many others might have taken a short-cut on Dresden Road, missing the clear direction that we had received to go straight on Buford Highway. Oh well, hopefully those runners would disqualify themselves when they realized their mistake. I pulled away from Carl after Dresden Road, and found that I was occasionally gaining on some of the other runners. There was one person ahead of me, also passing other runners, wearing what appeared from the back to be a "Five Stripes" soccer jersey - turns out it was an older-style FC Barcelona jersey and not an Atlanta United Five Stripes jersey. He had passed me for good on Buford Highway, but I was hoping to keep up with and perhaps catch up to him later in the race. The uphill section came up again after my watch had signaled mile 9 (1:20:30 elapsed), and I really slowed down this time. The wind in my face seemed stronger. I decided not to worry about it if I slowed down a bit, I knew that there would be downhills ahead, and the important thing was not to get too tired to speed up where the course turned to my advantage. At the mile 10 signal, I saw 1:30:00 on the dot on my watch, a solid 9:00 min / mile pace. I knew that I could finish the last 5K in 30 minutes or less, but also remembered that the Craft Classic course had been a little long, so I pushed myself as best as I could. Unfortunately mile 11 was also uphill, more than I had remembered, and I clocked my slowest mile of the race at 9:31, 1:39:30 elapsed, as I made the sharp right turn onto Shallowford Road. Nonetheless I knew that my legs were strong enough to carry me for 2.1 more miles in less than 21 minutes, and the next mile was going to be mostly downhill! For the rest of the race, I tried to stretch out the run intervals to 5 or 6 minutes, timing in two cases to coincide nicely with water stations. "Five Stripes" was still in sight, but I wasn't closing in on him. As I turned onto Buford Highway, I saw a marker for mile 11. Hmm, I was at 11.73 miles at that point. But then I remembered that the markers for the later miles in last year's race didn't make any sense, so I just ignored it. The mile 12 alert sounded as I crossed Chamblee-Tucker Road, 8:34 for mile 12, 1:48 elapsed! I was already moving pretty quickly, but switched the watch from pace mode to distance elapsed for the rest of the run. I put on a bit more of a kick until the downhill section ended, with my watch at 12.7 miles. Just 0.4 - 0.5 miles to go! Then, there was a mile 12 marker. Hmm. Hmm? My watch sounded 13 miles, 1:57 elapsed, just as Hola! Auto Sales came into view. It seemed like I still had some distance to go before I would reach Plaza Fiesta. At 1:58:00 elapsed, I looked at my watch and saw 13.14 miles covered. So I've just set a PR for the half-marathon distance, but I'm still on Buford Highway, and the finish line is nowhere close. "Five Stripes" is still running strongly, I decide that I'm not going to catch him, and just focus on finishing before the 2 hour mark has elapsed. I just kept running as fast as I could imagine, until the watch sounded for the walk break leading up to 2:00:00 elapsed, as I reached Amigo Auto Sales, 13.30 miles elapsed. Exact same time as the Craft Classic, except today there was no finish line. Still on Buford Highway! Very disappointed that the route was going to be very long. Going uphill for a moment, I decided to take one more walk break. It wasn't going to matter for time, and I only had enough kick for 1.3 miles. Fortunately after 30 seconds of walking, I was ready to run again. Finally, passed Dresden Road, but we weren't turning there, no, it was at Plaster Road that we would turn, 13.60 miles elapsed. But at least the finish line wasn't far away now. But it wasn't right there, either. We passed where we had begun the race, 2 hours, 3 minutes, and 30 seconds earlier. Where, oh where is the finish line? Oh where, oh where could it be? Finally there was the parking lot for Plaza Fiesta. A few people were cheering us on. At this point, I just didn't want to be passed, so I managed to speed up as I turned into the lot. There was the finish line uphead, people cheering, the clock read ... 2:04:30 as I crossed the finish line. Stopped the watch at 2:04:37, 13.84 miles elapsed. Wow, not only did I get a discounted registration, but I got more than half-a-mile extra, for free! Gee, thanks so much! All sarcasm aside, I was thrilled to see that I had run an average pace of 9:00 min / mile for the entire distance. My legs were sore but not terribly so. After saying hi to Bonnie, I went back to the finish line to wait for Carl and Myriam. Myriam arrived first, about 4 minutes later, followed in a few more minutes by Carl. When we compared our times and distances, we all had recorded 13.8 to 13.9 miles covered. Except for one of the later runners, who ran a PR by more than 10 minutes - covering 13.2 miles. So her watch was right and the others were wrong? When I got home and downloaded the Garmin data, I then thought to compare with the official race map. It was very subtle, and I had to expand the view to see the differences, but it turns out that we were supposed to turn at Plaster Road at the end of the first loop. Looking at the map, it looks like it's about 0.7 miles longer the way that we ran it. Note where miles 9 and miles 11 are located in the respective maps. Note where miles 7 are located in the respective maps. The policeman gave many of us the wrong directions at the split! Carl and I and many of the runners in front of us were wrong, not the runners who we saw ahead of us coming off of Dresden Road. Someone must have corrected him shortly after I passed, which would explain why we saw some runners ahead of us coming off of Dresden Road onto Clairmont. It's a good thing that I didn't say anything to those runners at the time. They probably had enough doubt for the next 6 miles that they had accidentally cut the course, until they finished, probably at 13.1 - 13.2 miles. Fortunately it didn't really matter to me for this race: it was a good workout, and I was pleased with how I ran, with consistent effort from start to finish, with paces within a fairly tight range of 8:34 - 9:31 min / mile. All of the 9+ min / miles were net uphill, so that strengthened my sense of having run very consistently, thanks to the run-walk intervals. What might I have done about the wrong race directions? This has happened to other runners in other races. The "official" answer seems to be that the runner is responsible for knowing the route. OK, I didn't study the route closely enough. (Probably because I've been pre-occupied with a very important grant application over the past month - and I get paid for chemistry, not for running.) But what if I had been 100% certain that I should have made that turn when the policeman had told me to go straight? What if there had been a last-minute change of route, and making that right turn would have put me into an unsafe situation? Or one in which I would have cut the course short - and could have been called a cheater - because the organizers made an adjustment elsewhere to make up for the last-minute change at mile 7? I've concluded that I would have reacted the same way if it was a volunteer instead of a policeman confidently giving directions, so the uniform of the person didn't affect my decision. Carl and I celebrating our finishes! One of the features that everyone was looking forward to was the food offered after the race. Each runner received four coupons for food selections. I had a quarter of a delicious pork banh mi sandwich with my first coupon, and a Guatemalan version of tamale with tomatillo sauce with the second coupon, absolutely wonderful. People were also raving about an Indian curry dish, but when I was ready to use my third coupon, they were out of food. In fact all of the vendors were out of food when the half-marathon clock was at 2:45 elapsed - still a respectable time, for which the course was open, but those finishers didn't get anything to eat at all. 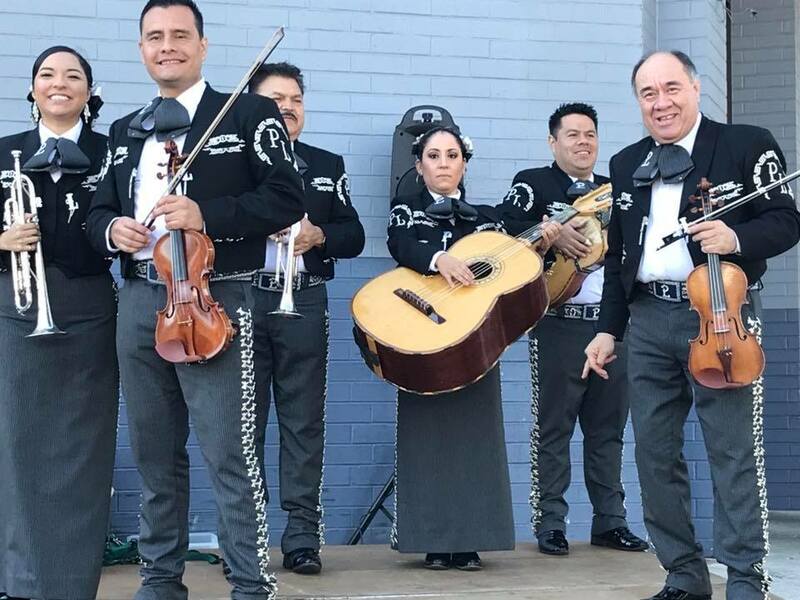 The mariachi band was quite good! My own performance, 4th out of 8 in my age group, 55th out of 179 finishers. (If you're wondering, I'm pretty sure 1st through 3rd place finishers in my age group also ran 13.8 miles.) Ultimately there is nothing to do other than to focus on the positive aspects of today's run. And I paid a discounted price, so I can't complain too much. But one of my friends paid $90 this morning to register onsite for the half-marathon. I hope that she feels that she got a fair value from the race for what she paid. Anyway, on to preparing for another half marathon next Sunday. That one should be an interesting race! Addendum: October 3, BuHi sent runners an apology e-mail. The motorcycle guiding the lead runner failed to make the turn at the correct location. About 100 more runners followed before the organizers realized the problem.